Microchip Feeder: How to feed different food to different cats? We originally posted this last fall, but feel it bears repeating with a few new tidbits. If you have more than one cat in your home, you may face one of several common problems. Maybe one cat is thin but the other is overweight. Or, one has bladder problems (crystals in the urine) requiring a special diet and the other cat has food allergies and can’t eat the urinary diet. Or, you have a senior cat with kidney issues who needs a limited protein diet and a kitten who needs a more dense protein/calorie diet. Short of having doors all over or physically separating cats (since gates typically don’t work), what to do? A clever solution is a microchip feeder from Sureflap. How does a microchip feeder work? It works by recognizing your cat’s microchip and opens a sliding door allowing your cat to eat. If your cat is not microchipped, don’t worry! Although we strongly recommend all cats have a microchip (see our several blog posts on this, most recently Microchip Your Cat: A Reminder from April the Cat), it also comes with a tag that your cat can wear on a collar. The feeder will recognize the tag and open the food door. Once your cat is done eating and walks away, the door closes. This stops other cats from gaining access to the food, and as an added bonus, the door shuts tightly to keep food fresh. You can use it with both canned and dry food. And it’s compatible with all brands of microchip. 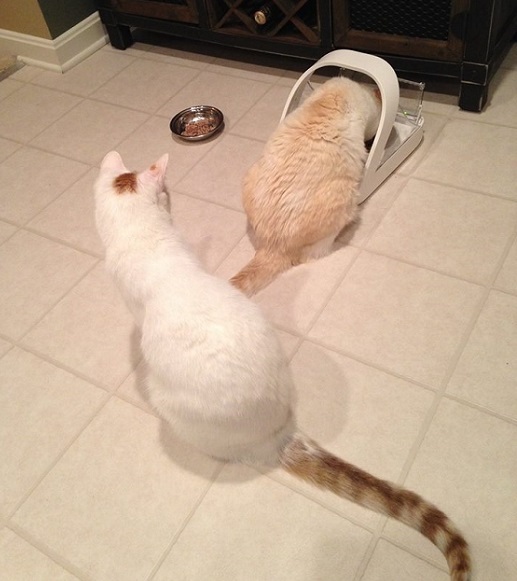 So if you have a challenging feline household, check out this feeder! On a side note – if you have a dog that likes to eat your cat’s food, this feeder is definitely dog proof! I have used this with my own cats. I purchased this feeder so that my senior kitty would have constant access to food. My younger cats quickly eat all the food and leave my senior with nothing. The Sureflap feeder allowed him to eat slowly whenever he wanted throughout the day/night. The photo shows him enjoying him leisurely enjoying a snack as his younger brother looks on with jealously!